I got tired of the reverb sleds being loose on the bench and grounded with clip leads. So I made some L-brackets to tie them together. The sleds will hang vertically as shown. This is the best orientation for them. I found the extrusion in the basement: I later recalled that it had been used to trim shower tile during the house remodel. The extrusion is anodized so there are lock washers under the pan head screws and nuts. They're bonded to each other at four points and I made sure to measure that there was a dead short between individual trays. 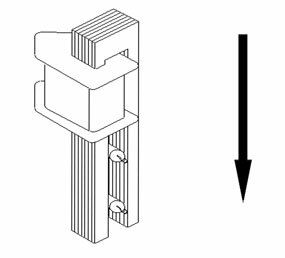 I'll be looking for some open metal hooks with machine threads in order to suspend the assembly in a shockmount using O-rings. I've got some fine Mogami cable to reduce conducted mechanical noise to the drive and receive transducers. 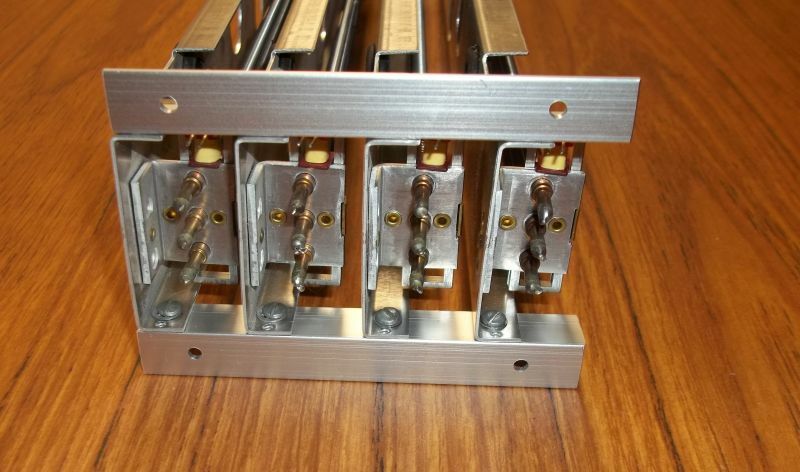 The ground lug for the sled frames - which provides a degree of electrostatic shielding - will be connected with something flexible like solder braid. I'm going to float both the drive and receive transducers and use a balanced recover amplifier. The drive will be grounded at the source. In order to reduce radiated hum from the power supply into the transducers I'm kicking around the idea of using a switcher. IIRC from back when my engineering group was specifying springs for powered mixers, they come in different versions for vertical or horizontal orientation. I think this is the default configuration. They may have had custom products that were otherwise. 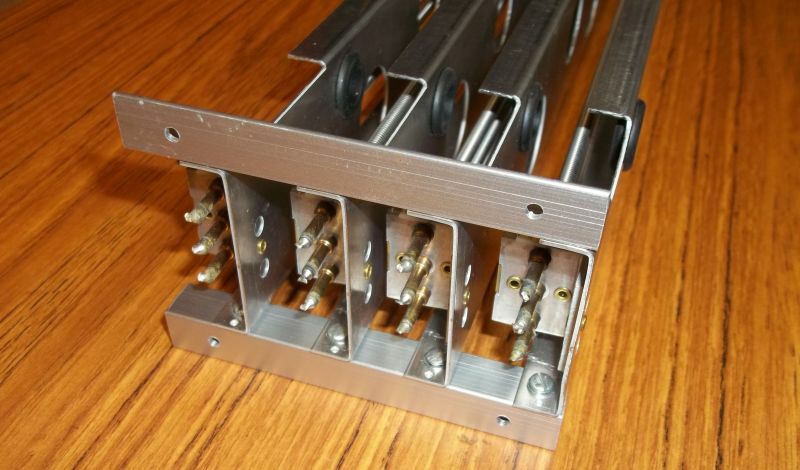 I think the orientation option deals with how the internal sled is sprung in the outer steel box as well as how it is connectorized. I'm using an "A" 10Ω drive coil wired in series and a "B" 2575Ω pickup coil wired in series hum-bucking. One drive coil polarity is reversed to compensate for the pickup coil being wired out-of-polarity. I'm playing around with the drive electronics today to find the flatest EQ'd approximation to current drive. Accutronics recommends current drive and we used it at MicMix. Current drive has a high output impedance and compensates for the inductive response of the transducer whose impedance rises with frequency. Synthesized current drive, using a build-out resistor several times the value of the transducer impedance, also has high output impedance. With the series-connected drivers the optimum build-out, according to Accutronics 5X rule-of-thumb, would be 100Ω. I want to use an EQ'd voltage drive output, with 0Ω output impedance because it sounds cleaner to me. The reason is somewhat similar to power amplifier damping factor: A 100Ω output impedance driving a 20Ω load has a damping factor <<1. A current-boosted voltage output would have an output impedance measured in milli-Ohms which provides a damping factor >>1. Accutronics specifies transducer impedance at 1 kHz. The impedance scales linearly with frequency e.g. at 5 kHz it's 50Ω per transducer. A first-order high pass filter at the right frequency driving a "0Ω" should approximate current drive over the limited frequency range of the transducers and springs. To check the EQ'd approach's approximation to a current source I used a 1Ω sense resistor in series with the ground connection of the 10Ω X2 transducers. This allowed me to measure the current indirectly. I used the recommended 28 mA (RMS nominal) drive current which conveniently works out to 28 mV on the sense resistor. If the current vs. frequency is constant, the voltage at the sense resistor will remain constant while the output voltage will increases with frequency. I originally used a filter with about a 1.5 kHz breakpoint. 3.2 kHz is the ideal break point to provide EQ'd "constant current" drive over a 300 Hz - 5 kHz (-3dB) bandwidth with the two series-connected transducers. 3.2 kHz also provides the flatest pink noise response in the recovered output. To my ear 1.5 kHz sounded better being slightly more bass-heavy. I also looked at voltage headroom. 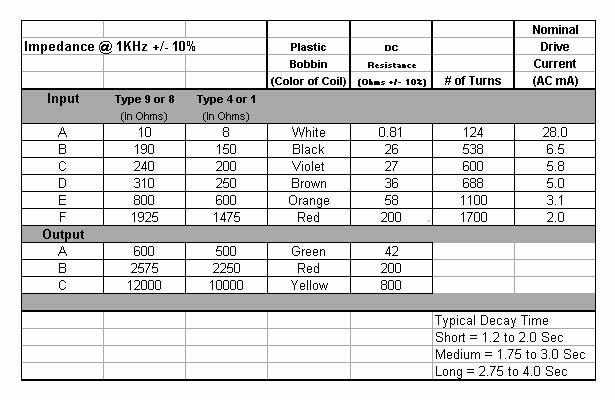 6 kHz is the outer range of reverberation. At 6 kHz 20V P-P will provide 77.5 mA (RMS) of drive which is about 9 dB headroom. At lower frequencies there is plenty of voltage headroom. Since 100 mA peak current is required, a current-boosted op amp will be used. For my experiments I'm using the Dual Class-A II (with NFB) which is overkill but convenient. My curiosity had me try a synthesized current output using a 100Ω build-out. The 5X approximation is based on Accutronics recommendation. It measured pretty flat with low-end more like the 1.5 kHz EQ'd response. To see if the driver transducer is capable of reflecting energy back into the current source I muted the drive and "plucked" the "strings" (springs). Sure enough, a significant amount of voltage was reflected back into the current source output. Switching back to EQ'd voltage drive did not allow back-EMF to develop. I'm pretty sure that's why voltage drive, with its "0Ω" output impedance sounds cleaner. After conducting listening tests I went back to the 1.5 kHz filter. The flatter pink noise response using the 3.2 kHz break point sounded a little bright. The original filter has a slighter bass-heavy tilt that is more natural and fuller. To my ear damped drivers fed by EQ'd voltage sources sounded better than ones fed by current sources. It occurred to me that series-connected drivers fed by a 0Ω source will still allow the back-EMF of one sled to drive the other. They are damped as a pair but not individually. The low output impedance of the driver allows one sled to influence the other. I can't say I heard it, but I knew it was there. When fed by a current source neither transducer is damped. Their ability to back-feed each other is limited however because the overall impedance of the loop is high, about 10X the impedance of each transducer. By connecting the drivers in parallel both are damped by the low output impedance of the voltage output driver. The 28 mA RMS nominal drive current for series-connected transducers becomes 56 mA for parallel-connected ones. 10 dB headroom now requires about 180 mA RMS or 250 mA peak of drive current. The voltage drive required is halved. For now I'm going to continue to use the DCAO-II to drive the transducers because it has the output current capability. I'll reduce the bias current to about 25 mA and begin hookup of a switcher to power it. The bench supply I'm using doesn't have enough current to handle the peak demands of two channels. I re-assembled the driver and decided to post a visual and sound file of the pulse response. 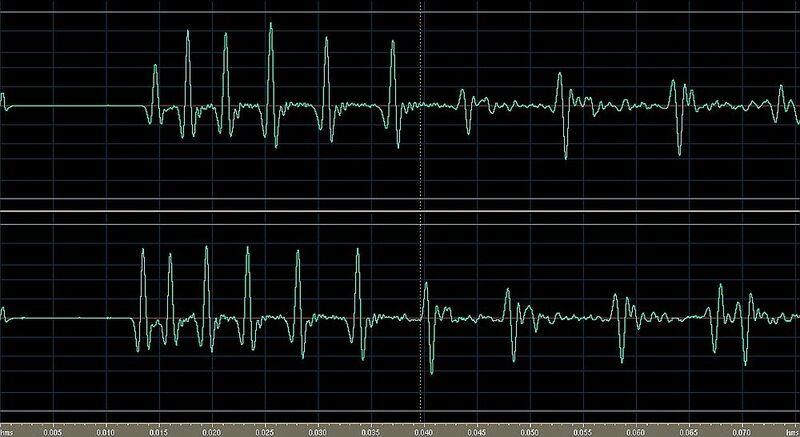 The left half of the waveform is the pulse response of the first-order echos. The secondary echos begin in the right half of the screen. The left channel, beginning at 13.5 ms, is on the bottom. Note the interleaving between the left and right channels. The timings are "linear" in the log time domain. MasterRoom XL-305 Clone First-Order Echos. The following sound file is the pulse response to a single-cycle tone burst at 50, 100, 200, 400, 1000, 2000 and 4000 Hz. Note the absence of flutter echo, "boing," and the smooth decay tail. It's all in how the springs are cut. Now that I have my Tenma LCR working I've had a chance to make some measurements of the Accutronics transducers. The drivers are the 10 Ω (@1 kHz) "Type 9 white bobbin" version wired in parallel. At 1 kHz the driver transducers measure 0.759 Ω + 737 µH. The pickup transducers are the 2575 Ω "Type 9 red bobbin" ones wired in series. At 1 kHz the pickup transducers measure 998 Ω + 804 mH. I have two 0.75A current-limiting protection fuses of different manufacture for the drivers. One measures just under 0.15Ω the other around 0.35Ω. Though I should use smaller-value fuses to protect the drivers from overdrive the resistance is too high. A 0.75A fuse should protect the transducer from DC faults which I suppose is the main goal. I just joined this forum. I found it while searching for M/S info so I could build my own encoder-decoder circuit for experimentation while recording and mixing, glad to see there is already a much more precise implementation than I would have come up with on my own. 1. Do you plan to release a PCB for the driver and recovery circuit you are using? I built a current drive circuit based on the info here: http://sound.whsites.net/articles/reverb.htm. It sounds pretty good to me but I'm curious to try EQed voltage drive based on your comments. I'm also getting a lot of bleed from the high end of the input side into the recovery amp, maybe my board layout is bad. It seems like more than just the high frequency bleed mentioned earlier in this thread because it's a lot less if I just go straight to console preamps from the tanks. Similar frequency range though from what I'm hearing. 2. For hum-bucking pickups, are you reversing the orientation of the coil on the magnet or simply swapping polarity? I don't know too much about guitar pickups, but from some Jim Williams comments I've found in other forums, as well as some descriptions of humbuckers, it seems like you need a custom configured tank with the pickup coil's orientation reversed in addition to reversed polarity wiring in order to do this properly. I can't see a way to do this without breaking the magnet but maybe they can provide tanks that are built this way? I'm curious to try snipping the springs to length, those audio samples sound A LOT smoother on percussive input than my relatively sproingy setup. It looks like I'm using the same type 9 tanks, which are already much smoother than my standard impression of spring verb, but it would be nice to go even further. Anyway, thanks for this thread! Hi Greg, thanks for joining us here! WRT the high frequency bleed some may be layout-related but I think there's mutually-coupled inductance in addition to the desired torsional/mechanical transmission mode. I think the spring may be magnetically-coupling the driver transducer field to the pickup in a very narrow frequency range. Its a hunch at this point - with only one set of springs and transducers I decided to quit while I was ahead and stop experimenting. I've been asked by a client to custom-build a second set of springs which I'm doing now. Whether or not I do a board to complete that project remains to be seen. While I'm pinging springs I'm going to see if I have the bleed-through with none mounted. I do remember dealing with this at MicMix and the constant-current driver compounded the problem. The driver required extra rolloff and there's a 3 pole filter around 5 kHz in the original. The coils are not true-hum-bucking only wired in anti-polarity at the pickup and anti-polarity at the driver to compensate. It does make enough difference to do it. I may be close to buying some mu-metal on eBay to shield the pickups. Accutronics also advise to shield the drivers which makes sense, since the pole-pieces could re-radiate an existing field. I am using a fully-balanced instrumentation amp for recovery direct-coupled into a 5532 or NJM2068 and followed by a THAT1240 for CM rejection. Most of the hum is normal differential mode hum picked up by the coils but I've found that there's a lot more common mode interference and hum even with short well-shielded leads.